OTTAWA - The prime minister was among the majority of MPs that helped defeat a Conservative MP's pro-life motion Wednesday, but ten of Stephen Harper's ministers voted to keep the debate alive. Public Works and Status of Women Minister Rona Ambrose was among the members of cabinet who rose to vote in favour of Stephen Woodworth's private motion to study the definition of human being in the Criminal Code. The motion was defeated by a vote of 203-91. Harper had called Woodworth's motion "unfortunate," and in the spring said he would vote against it because of his party's electoral commitment to not re-open the debate on abortion. But more than 80 Conservative MPs did not appear to view their vote as a contradiction to the election promise. "It's unacceptable. 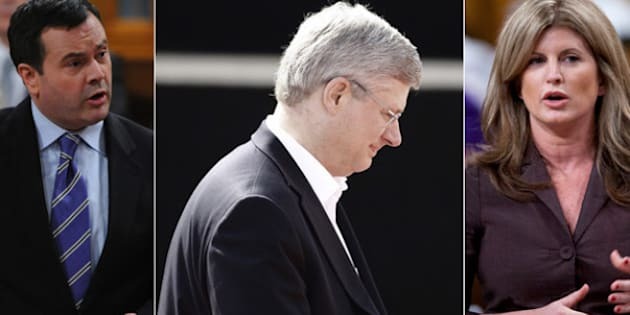 Stephen Harper told us his government wasn't willing to reopen the debate and you have the minister in charge of the status of women voting (in favour)," said NDP MP Niki Ashton. "At what point do the Conservatives consider women's equality a priority?" This being a private member's motion, and an issue of conscience, MPs were allowed to make a personal decision on the vote. Four Liberal MPs also voted in favour of the motion that would have taken a look at when a child is declared a human being in the Criminal Code section on homicide. Woodworth told reporters that he hoped his supporters would keep up the pressure on MPs. "I hope that people all across Canada will really take to heart, will be moved to advocate that we enshrine in Canadian law the inherent worth and dignity of every human being," Woodworth said. Currently, the Criminal Code defines a child as a human only after it emerges alive from the mother's body at birth. Woodworth and his supporters point out that the landmark 1988 ruling confirming abortion rights in Canada also noted the potential need to protect unborn babies at some point during a pregnancy. Woodworth's motion was used as a sort of political football, and not only in Ottawa. Agnes Maltais, Quebec's status of women minister, sent a letter to all MPs from the province earlier Wednesday, reminding them that the national assembly as recently as April voted to protect abortion rights. "You are representatives of Quebec elected to the House of Commons," she wrote. "I ask you to respect the will of the people of Quebec as expressed by the national assembly and therefore to vote against this motion." The NDP has accused Harper of essentially putting abortion back on the table for debate through Woodworth's motion. "Mr. Harper can't have it both ways,"said NDP Leader Tom Mulcair. "He can't claim that he's against reopening the abortion debate and having a sitting minister vote in favour of reopening the abortion debate. "The two just can't be squared." Still, Liberal Leader Bob Rae said allowing free votes on such matters is a venerable Commons tradition that must be respected. "What we have achieved in Canada ... is, I think, a very powerful national consensus, and that is not unanimity but a consensus, and that is, that this is a matter that's better decided on an individual basis by a woman in consultation with whomever she chooses to consult," said Rae. "I don't think that's going to change, I don't think tonight's vote is going to change that, I think it will be more of reflection of that consensus." Rod Bruinooge, a Manitoba MP who once put forward his own pro-life motion, said Woodworth has already achieved part of his goal. "It's caused a good discussion as to when life begins," said Bruinooge. "I don't expect that it's going to pass, that's my honest viewpoint, but I think it's been a good discussion and I think that's really the net result that the member wanted to achieve."